Emerald Gaiety is a cultivar of the Euonymus fortunei plant, a broadleaf evergreen shrub commonly called wintercreeper. It belongs to the staff-tree family, making it a relative of the bittersweet vines. Euonymus fortunei is a dense grower that can take the form of a shrub or a vine. It is popular as a ground cover and a foundation plant and can be grown in USDA plant hardiness zones 5 through 8. Euonymus is considered invasive in some areas and should be planted with care. Emerald Gaiety grows to a mature height of 3 to 5 feet, with a slightly greater spread. The branches grow upright. Despite being classified as a shrub (bush), Emerald Gaiety euonymus can be grown as a vine. If this is how you would like to use the plant in your landscaping, provide support and train the branches up the support, tying them up with twine or tape. Emerald Gaiety is prized for its variegated leaves, which sport emerald green centers and creamy white edges. This is a slow-to-moderate grower. Grow the shrub in full sun to partial shade. The members of this species that display green and gold colors on their leaves tend to have their best color when grown in full sun, but many gardeners feel that the color is better on Emerald Gaiety euonymus when it receives a bit of shade.​ These shrubs will grow best in a well-drained soil. They need an average amount of water. As small shrubs, Emerald Gaiety euonymus work well in foundation plantings. Some people use them as ornamental hedge plants ("ornamental" because they are not tall enough to provide privacy). When massed together, they can also serve as a ground cover. And since they can assume the form of a vine if given support, some homeowners train them up a mailbox post. Indeed, because these plants are tough, tolerating pollution and drought moderately well, they are effective in mailbox plantings. 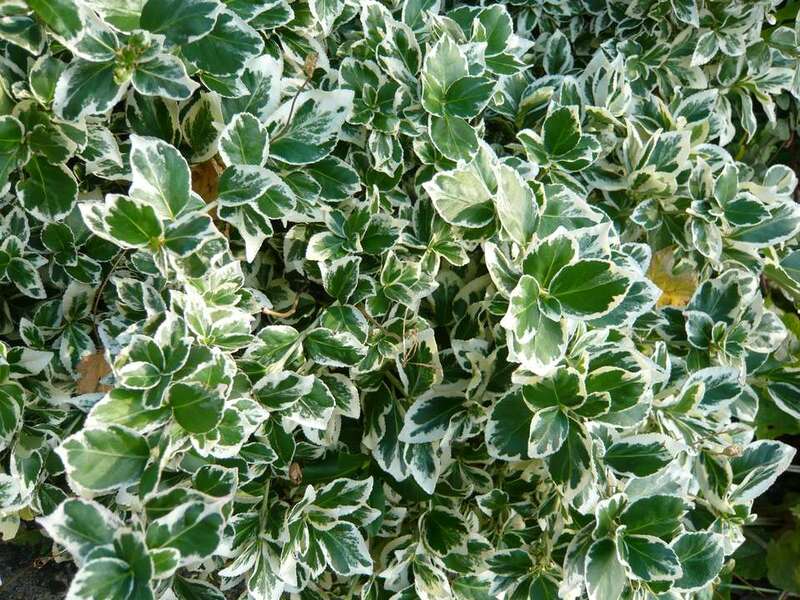 One thing to watch out for when you grow Emerald Gaiety euonymus (and other two-toned types, as well) is a reversion. That is, the shrub over time will likely try to revert back to the way the species plant looks and push out new branches with leaves that are all green. Prune off those shoots when you find them. Attacks of scale insects are another thing to keep an eye out for. If you can catch this problem in time (while it is still minor), repeated sprayings of Neem oil insecticide (it is organic) may do the trick. Generally speaking, the strong point of this shrub is its bright, cheerful color pattern. Being an evergreen, it holds some potential for visual interest in winter. But if you live in a region that can receive heavy snowfalls in winter, you will want to train it to assume the form of a vine by growing it up a support, thus raising it above snow level. The white accents in Emerald Gaiety leaves often get some pink color in them in winter, making them even more colorful than during the other three seasons of the year. The branches of Emerald Gaiety euonymus often root where they make contact with the soil. This can be a good thing or a bad thing. It is good in the sense that, if you are using it as a ground cover, it will spread and fill in an area nicely, so that weeds will not gain a foothold. But this fact also means that the plant is potentially invasive, depending on the region in which you live. For example, the Missouri Botanical Garden recommends against using this plant in landscaping due to its invasive behavior in that region. Another well-known species in this genus is E. alata, the burning bush.